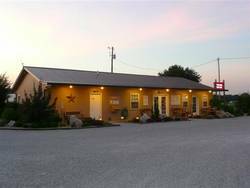 Description: Small, new, all fhu campground located adjacent to I-65 & about 20 minutes from Mammoth Cave National Park. The owner just bought this campground in May 2008 & is working very hard to upgrade & add ammenities to the place. For those of you who need clear space for satellite reception, this is the place. Since the campground is just 2 years old, trees (what ones they have) are VERY small. All sites are long, level & gravel (some also have gravel patios) with modern power pedestals having soft photocell-controlled lights on them. Sites do not have individual fire-rings. 3 "community" fire pits are spaced evenly in the campground. Not all sites had picnic tables either. It seemed just the ones with the gravel patios had them, for now. The owner is working to add both of these items as funds permit. There is no pool, playground or campstore, but it does have free Wi-Fi & cable TV is available for a small daily fee. Since the campground is located in close proximity of several hotels, I suggested he work out a deal with them for pool access for his guests. The restrooms & laundry were immaculate & bright. The campground is also located within walking distance of a McDonalds (with a playland) & a Cracker Barrel. Being so close to an interchange, there is going to be freeway noise - most noticeable in the still of the evenings. There's also a train track about 100 yards away & a nearby go-kart track that runs until about 11pm. Some may find these sounds annoying or disturbing, but that's what you get with a campground located in the area it is. This campground is a basic "bare bones" place that's good for an overnight on the way through or to use as a base while visiting the National Park & tourist-trap novelties in the area. It has a lot of potential & as the new owner adds more ammenities, it will be even better. Price paid reflects 50a/fhu+cable site. I would have rated it higher if there were more ammenities (i.e. pool, hot tub, shade). More pics of this campground under my username in the Photos section. We came in on the back of a wrecker and were surprised and pleased at the reception we received. The owner is truely proactive and welcoming. He even made me a cup of coffee and carried it to me. The campground is immaculate and beautifully landscaped. It is convenient to good restaurants especially El Mazatlan. Because our fifth wheel was disabled the owner let us leave it at the campground for a very nominal charge per night. We would go back there as it is a well-located campground near many places of interest especially if you are a spelunker or a rock collector. Argumentative woman charged my credit card the day before I got there, refused to honor my Good Sam Membership, the Cave City Chamber of Commerce 10% discount, and charged me for 3 nights and I only stayed 2. I will get my money back. Watch me. Pirates! We stayed here one night in December. Late night arrival required that I fill out by hand a credit card sales form. In the morning my card had been run manually. Seems an odd way to do it. The campground was for the most part empty. We found our campsite w/o too much trouble. Signs are posted that if you drive on the grass it is a $125 dollar fine . Another sign said not to drive through campsites.....well I drove through an empty site at midnight before I saw the sign. The owner in the morning asked if I drove on his grass . I did not, but he did say that he hated it when RV'ers drove on the grass . Patty and I weren't enamored so we moved on after one night. Nothing turns me off more than a bunch of threatening signs. Not our kind of campground. Full hookup sites 50/30/20 amps water (turned off in winter) sewer and cable. Cons: Lots of trains going by in the middle of the night.